Brooke and Tim are high school sweethearts who grew up in Southeastern Virginia. 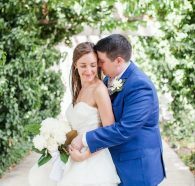 They were married in June 2017 and blog about marriage preparation and the joys - and challenges - of newlywed life. For most of my relationship with Tim, my heart and mind have been three steps ahead of my actual life. What I mean is that for most of our dating relationship, I longed for the days when we’d be married. I was always focused on what our “next” step was. I constantly struggled with feeling like God had planned an amazing life for us which we couldn’t yet live. I knew He was calling Tim and me to marriage, but the day when we would finally be husband and wife always felt so far off. It was a challenge, almost every single day of our dating relationship, for me to be content with the life I was currently living. I’d pray so hard to be grateful for all of the amazing things God was doing in my life and in our relationship, at the present time. While all of those things are true, and I knew it at the time, they didn’t necessarily help my aching heart. It wasn’t until I learned to ‘recklessly’ trust in God’s faithfulness that the ache dulled. It was this trust in His faithfulness – trust that God is good, that He is who He says He is, that He is for me and not against me – that helped me be content in the stage of life prior to my marriage. But where am I now? Married, yes. But am I finally content with this stage of life? Am I finally grateful and content – with no desire for more or the “next” – with all aspects of our relationship? I try to be, but the answer is sometimes no. While we are truly living some newlywed bliss, we catch ourselves sometimes focusing unnecessarily on what will come next. When we are out and about in the beautiful city we live in, we often find ourselves gazing at all of the homes and picking out our “dream” one. We easily get caught up in conversations like “where are we going to be in 10 years?” and “when we have more money, we’ll…(insert x, y, or z)”. We have a list of “next purchases” that we think will help make our home more complete. Most of the time when we get caught up with conversations like this, we are picturing our future family when we have children, have been with our jobs for a while, and are hopefully homeowners. While there isn’t necessarily anything wrong with looking toward the future, or planning ahead, we’ve found that right now these conversations lead us towards discontentment and ingratitude. When we are constantly thinking or talking about what is next for us, we fail to focus on the right now of our wonderful life together. We tend to be much less thankful for, and content with, what we have at this stage of life when we are always focused on the next stage. And yet, we spent so long praying for and aching for this stage of our life together. I don’t want to waste it, or miss it, or take it for granted because I’ve gone back to my old ways of not trusting in a God who is always faithful in the now. I don’t want to be ungrateful for this time that I’ve waited so long for because I’m looking again for the next. No, I want to savor this stage of our life together. I want to praise God for our life and be grateful for all of the wonderful blessings He has given us as newlyweds. I want to be content with what we have, and not miss out on God’s grace and faithfulness by being focused on what we don’t have. So everyday, I remind myself again and again that God is faithful – He is who He says He is – and my path towards gratefulness and contentment is found in trusting in that truth.